Story by Jackie Serrato (SJNN Fellow Cycle 1). It’s Friday night in Little Village. The wind occasionally carries distant laughter or the tan-tan of a corrido from someone’s backyard. Yet the curtains are drawn and few people linger on their front steps. The shadows of the side streets give a courteous warning to visitors. Almost all businesses on the commercial artery lock their doors before the self-imposed 11pm curfew — partly wounded by the recession and partly fearing the hype. There are residents who take a late shift at work or maybe go to the baile for a night out. But it’s gangbangers and police who keep vigil on the streets. The dozen-plus yearly murders, most of them between gangs within a two-mile stretch, mean that during the warmer months in Little Village, people look over their shoulder come sunset. In national news depictions, violence in Little Village is partly provoked by an international drug trade run by Mexican cartels that work with local gangs. High-profile investigations have found a cartel link in Little Village. But many residents feel – and statistics propose – that the weekly violence in Little Village is not driven by drug smuggling but is rather the result of decades-long battles over turf and identity. And the misconceptions hurt the neighborhood by creating an unfair image of Little Village that fails to get at the roots of the violence. Law enforcement and the media perpetuate the idea that if violence is gang-related then it must be drug-motivated. In 2012, Jack Riley, special agent in charge of the Drug Enforcement Administration in Chicago, told the Washington Post that local crime stemmed “from gangs trying to maintain control of drug-selling territories.” After Riley himself conducted a tour of Little Village, an alleged drug “hub,” he also stated law enforcement would “have to operate as if we’re on the Mexican border.” A year later Bloomberg reported that the “pipeline of Sinaloa drugs to Chicago runs through Little Village.” And convinced that Sinaloa capo Joaquin “El Chapo” Guzman was the ultimate threat to the city, the Chicago Crime Commission declared him Public Enemy Number 1. Some media claims had us believe that gangbangers from the Southwest Side of Chicago were carrying out drive-bys for El Chapo. Considering its place on the map and intricate network of highways and rails, Chicago is a desirable circulation point for import-export industries. 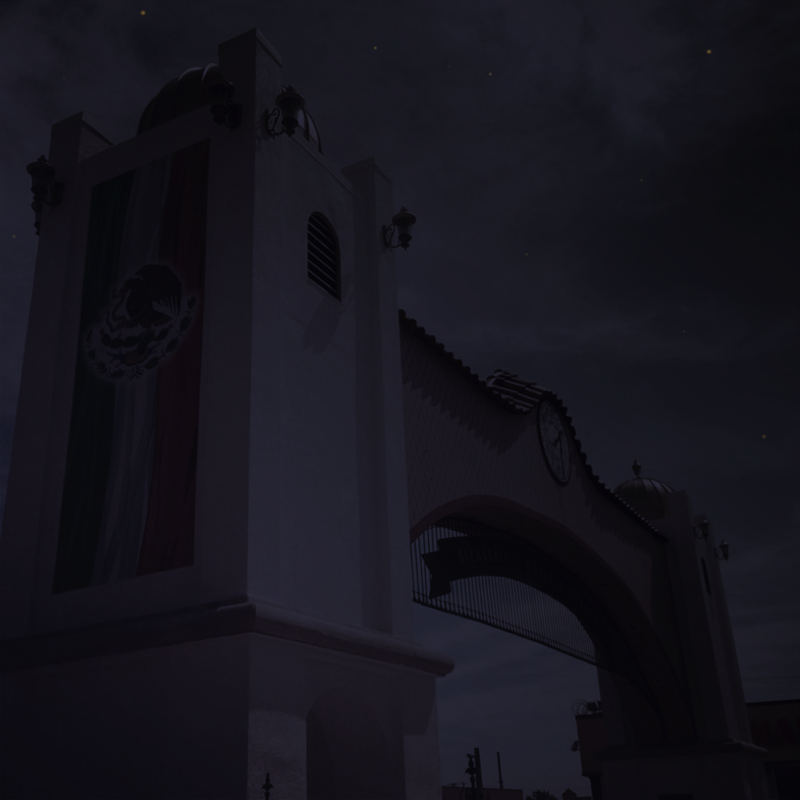 This infrastructure helped thousands of Mexicans make it to the Midwest throughout the 20th century, drawn to the booming industrial city and jobs. While cartels utilize our transportation system to supply the growing demand for narcotics, the idea that murders in Chicago are always incited by drug-related disputes and that all gangs function on that premise is simplistic and must be discarded. 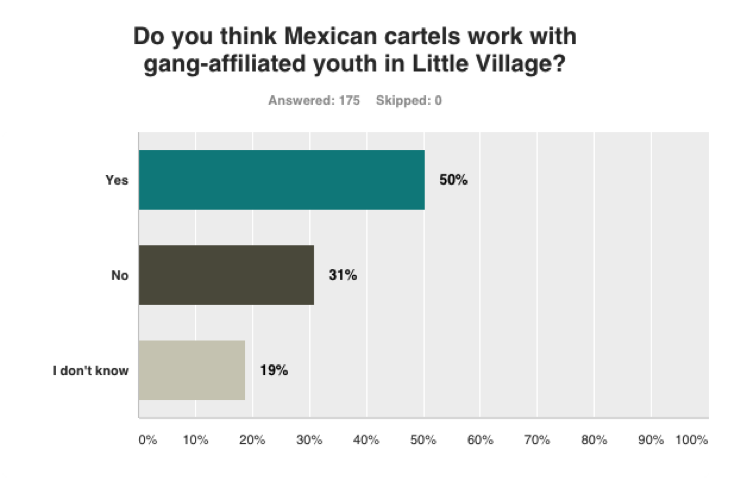 Residents who live in Little Village have varied views on the gang-cartel link, drawing their conclusions from what they see on the news and what they see on the streets. Over the summer of 2014, I explored and documented the opinions of a wide range of Little Village residents through a series of interviews and a bilingual online survey targeting local residents. 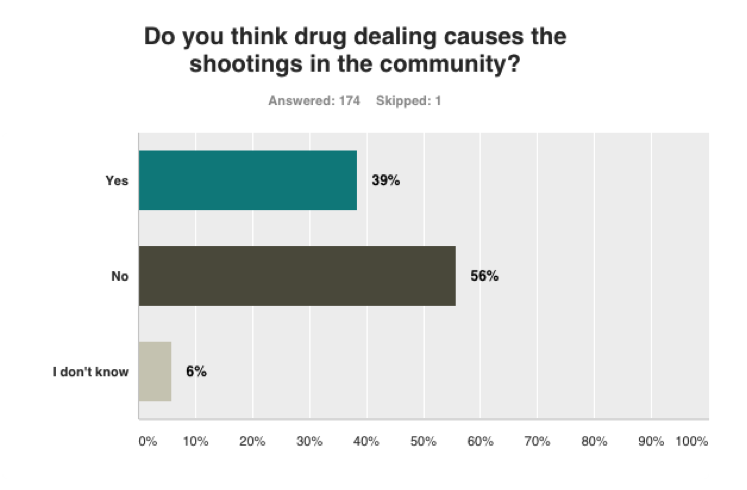 While half of respondents believed there was some relation between gangs and cartels, the majority didn’t think drug dealing was behind local shootings. The history between the predominant gangs in Little Village, the Gangster Two Six and the Latin Kings, can be traced back to the 1960’s or earlier. I spoke with the Little Village CeaseFire Outreach Coordinator, Jesús Salazar, who fosters relationships with youth to reduce the impetus for violence, to get his perspective on how gangs got their start. Like the children of other immigrant groups who created athletic or cultural clubs, Mexican descendants had to come together to construct a new identity in an unwelcoming place. But as opposed to European immigrants who, with time, adapted to the larger culture, Brown youth faced the added barrier of color and were severely deprived of adequate public services and social capital. As Mexican-Americans settled into more areas of the city and as police criminalized street clubs in these communities, they split up, ceased to be or merged into the different factions that we know today. 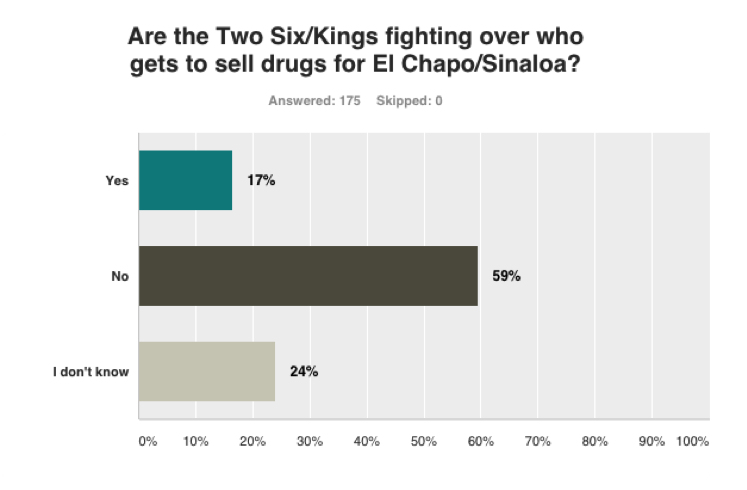 It’s nearly impossible to track when or why the Two Six and the Kings went to war, but local knowledge affirms that the ongoing conflict between the gangs spans generations, before the considerable growth of cartels in Mexico and the U.S. Midwest. This vengeful feud sparks the homicides in Little Village. “You shoot one of mine, we shoot one of yours. You shoot two of mine, we shoot three of yours,” Salazar said of the shooters’ mentality. Much of Little Village’s narco image revolves around the case of two brothers who were raised in the community, Pedro and Margarito Flores. 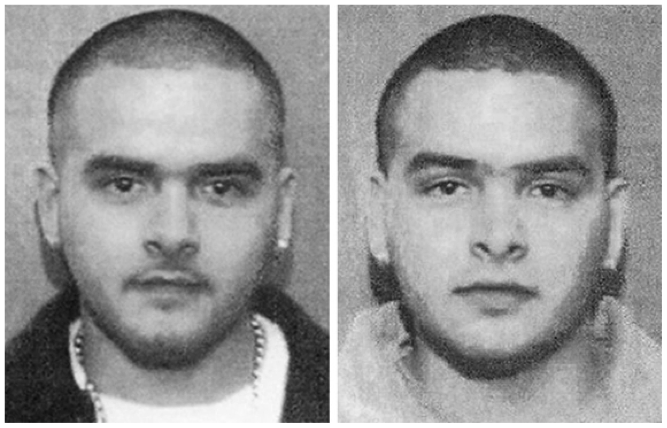 The Flores twins socialized with their neighborhood gang, residents say, but never became active members. Instead, they inherited their immigrant father’s business connections, which led to a trafficking partnership with Jesus Vicente Zambada Niebla (Vicentillo) of the Sinaloa Cartel and with the Beltran-Leyva Cartel simultaneously. Pedro and Margarito Flores. Photos courtesy of U.S. Marshals Service. In 2005, years into their collaboration, the twins were indicted in Milwaukee and became key informants on the Sinaloa Federation. Between August and November 2008, “in furtherance of the investigation” as specified in court filings, government agents closely monitored and permitted the entry of tons of cocaine and multi-kilograms of heroin to Chicago. Fast forward some years and Vicentillo has pled guilty to coordinating shipments during the four-month period of surveillance, receiving a minimum ten-year sentence in Michigan. The Flores family is in protective custody. 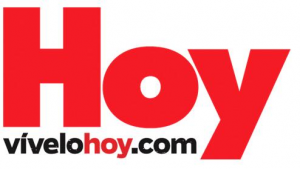 The indictment did not demonstrate that the Flores’ trafficking activity logistically involved Little Village gangs; and there’s no indication that the movement of Sinaloa product was centered in Little Village. According to the evidentiary proffer in Zambada’s case, the brothers were trusted customers who would receive the narcotics on consignment from another transshipment city, usually Los Angeles; warehouse them across Chicago and suburbs like Bloomington, Palos Hills and Romeoville; and conduct wholesale distributions to northern cities such as Detroit, Cincinnati, Philadelphia, DC, New York and even Vancouver, Canada. The brothers recruited several childhood friends into their enterprise, and they also dealt with African American gangs known for their open-air drug operations in Chicago. But nothing in the indictment describes acts of violence or business transactions with Mexican American street gangs. The siblings owned various homes and legitimate businesses in and out of state and did not stick around Little Village once they were earning millions. Lacking more evidence, it appears the infamous Sinaloa-Little Village connection boiled down to the Flores brothers. The extent of the relationship between the narco twins and neighborhood gangs? La cuna, the cradle. 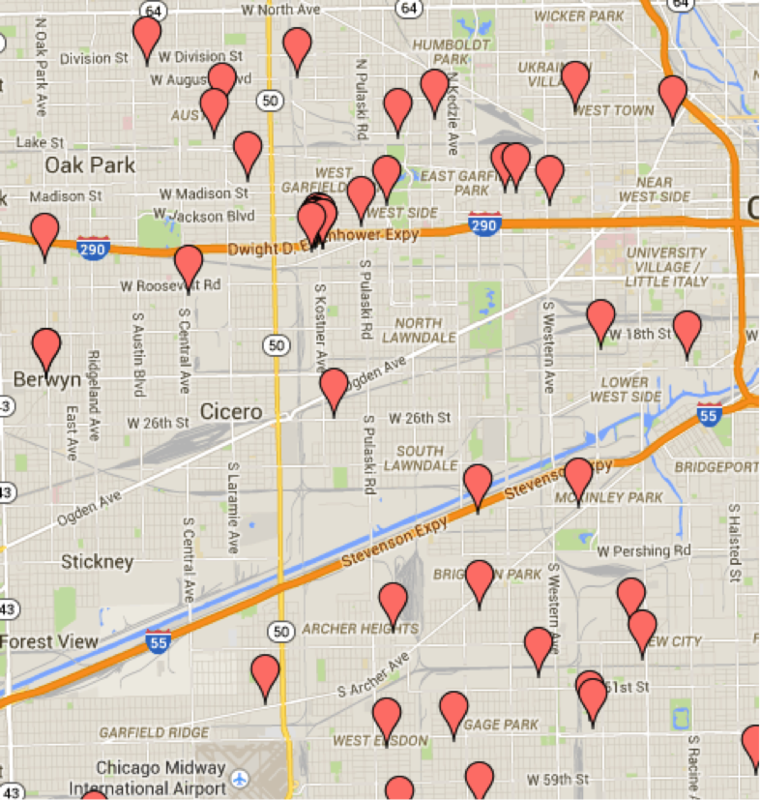 Number of Drug Arrests in Little Village in 2013. Chart by Jackie Serrato. In 2012 the Washington Post reported DEA assertions that the operation was “selling a record amount” of heroin and methamphetamine from Little Village. Yet, police statistics confirm that, at least on the streets, heroin and hard drugs are not prominent and do not have much local appeal. In 2013, of the 452 narcotics arrests in Little Village, over half were for marijuana possession, 21 percent were for cocaine, and only seven percent were for heroin. 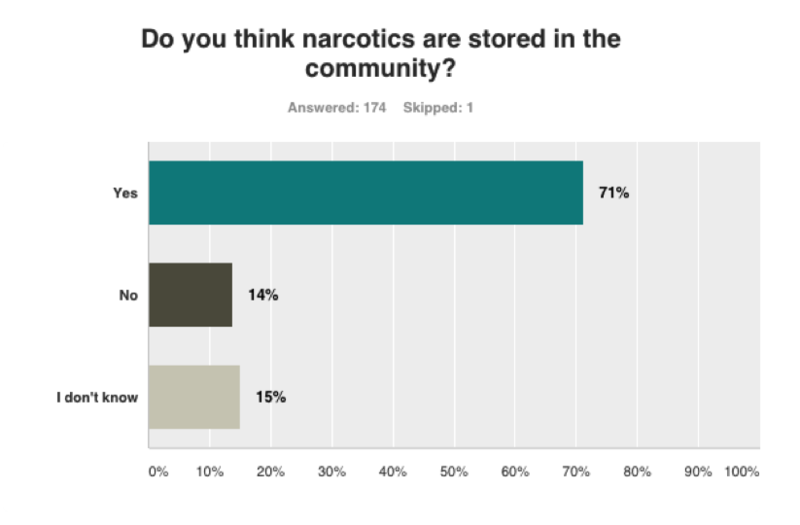 89 percent of residents who answered the confidential survey for this story also said they had never been solicited to buy heroin in their life. Art Guerrero directs a substance abuse mentoring program that serves every youth on juvenile probation in Little Village—hundreds in all. About 75 percent of kids who go through the Urban Life Skills program are gang-involved, Guerrero said. Every week he holds group meetings on both sides of the gang line and regularly administers drug screens. Most kids use marijuana and “some” cocaine and PCP, he said to me, but added that “never once in the eight years that I’ve been here have I done a drug test on anybody where they’ve tested positive for heroin.” Despite popular belief, not even gang-involved youth in Little Village who have entered the criminal justice system can be categorized as dope fiends or dealers. 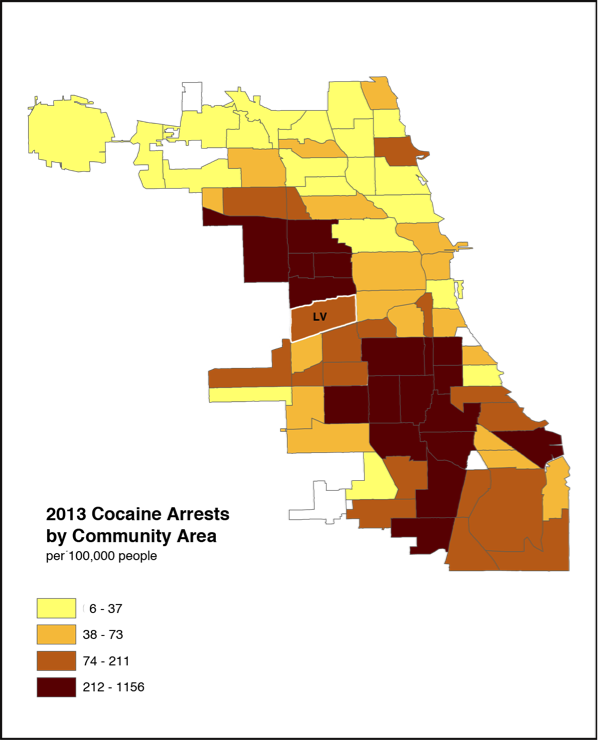 Further analysis of police data from 2010 to 2013 shows that, when controlling for population, narcotics arrests in Little Village are comparable to other predominantly Mexican neighborhoods in the city such as Pilsen, Gage Park and Brighton Park. 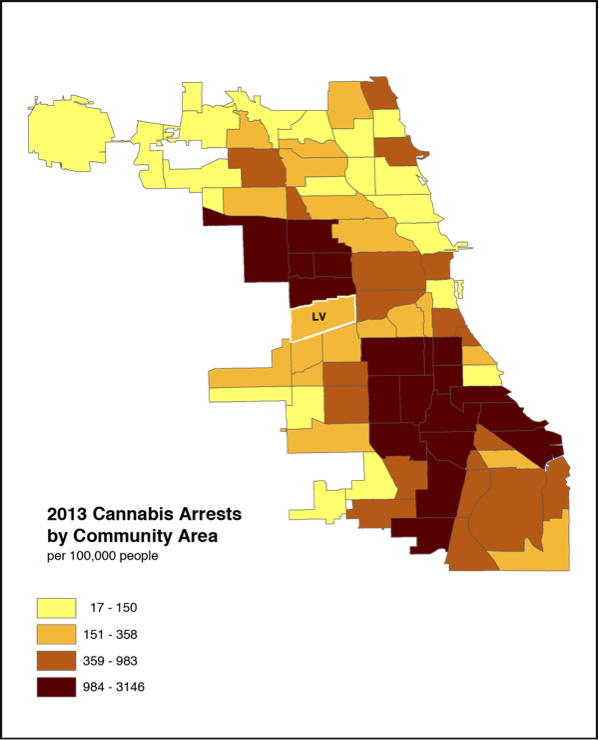 As illustrated in the heat maps below, numbers show that the drug situation in Little Village, including heroin use, is on par with the rest of the city. Alderman Ricardo Muñoz has seen gang violence play out in the 22nd ward for two decades. What’s more, Muñoz stated that there are no open-air drug markets in Little Village. 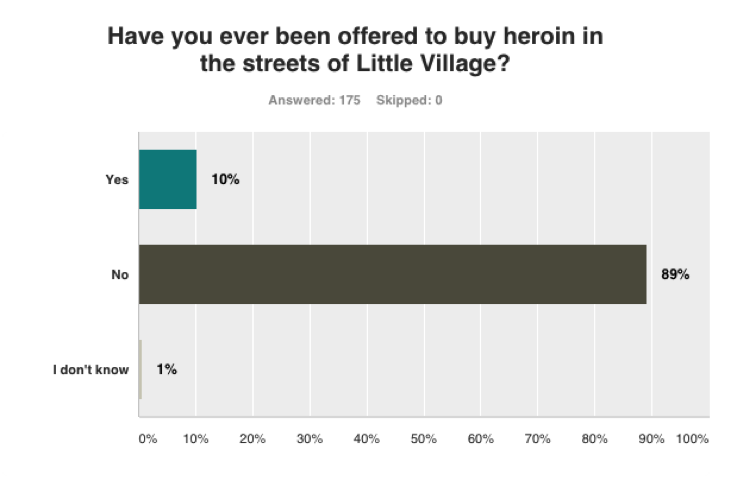 Unlike areas in Chicago where there are visible “spots” to get served drugs, Little Village does not have a particular intersection or block where someone can engage in a drug exchange at any given time. Since drug spots are difficult to locate, it raises the question of whether drug territory actually drives gang homicides. That said, Little Village gangs are most definitely territorial, but the infamous gang border is not dependent on the sale of narcotics. If dealers fought to control drug corners in Little Village, the gang boundary would be constantly moving to reflect that. But in recent memory, the traditional borderline has practically remained in place and is recognized by both gangs, long-standing residents of the community, and the Chicago Police Department. If Little Village residents are not buying or consuming these chemical narcotics, then could it be that the contraband is being stored in the community? Many survey participants believed that it is, likely due to the neighborhood’s commercial and industrial corridors and its population density. Map courtesy of Natalie Moore. Click for full map. 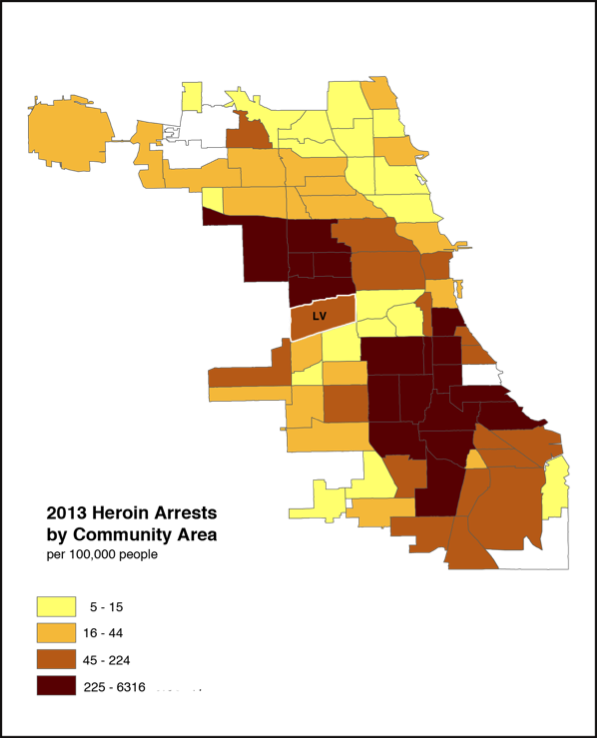 On the other hand, it’s revealing to examine drug seizures in the greater Chicago area. WBEZ’s Natalie Moore mapped the major drug and money busts (worth more than $400,000) since the year 2008, based on press releases from CPD, DEA, FBI and U.S. Department of Justice. What stands out at a first glance is that stash houses are found throughout the city and extend west into the suburbs. But they clump up immediately north of the Interstate 290 and south of the I-55 Expressway. Little Village (South Lawndale) sits comfortably between both highways but, upon closer inspection, is actually one of the cleanest areas in Chicago. Even if a warehouse with a 60623 zip code were to be found tomorrow, Little Village would look like an oasis of calm in the dynamic drug landscape. When Little Village stash houses do make the headlines, however, the suspects tend to be what local Chicanos call paisas or recently arrived Mexican nationals, who are oblivious to the function of street gangs. Gang members in Little Village say the gang philosophy discourages the handling of hard drugs. Becoming dependent on highly addictive substances tarnishes the collective image of strength that gangs need to maintain for recruitment and survival. Severe physical addiction makes for a dysfunctional gang member who cannot carry out his street duties reliably, who could jeopardize the resources of the organization, and who might attract unwanted attention from the police. There’s an added dose of paternal concern among gangbangers to keep minors on the block from having access to lethal drugs. 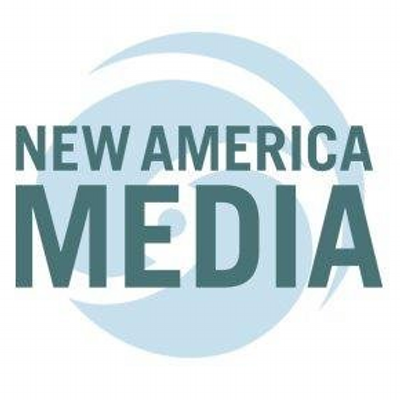 Practical and ethical reasons explain why certain Mexican American gang structures prohibit what they perceive as self- and community-destructive behaviors like the sale and use of heroin or crack. To be fair, while gangs in Little Village are not at war over drug traffic, some members take up dealing modest quantities of the more conventional substances. 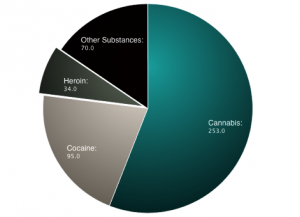 After all, there is a demonstrative presence of cannabis and cocaine in the community, as shown earlier. This is particularly expected from higher-ranking members who have built up a rap sheet and cannot enter the legitimate workforce. Gang chiefs are often indicted for charges that include possession with intent to distribute ounce-levels to two-digit pounds of marijuana and cocaine—insignificant amounts compared to the hundreds of kilos routinely moved by cartel elements. The most recent example was Juan Amaya, Inca of the Latin Kings, who was sentenced in 2014 for serious charges that included approximately two handfuls of cocaine. Gang members who engage in drug dealing do so within an intimate circle so as not to bring heat to the organization. According to Trap-Oh, selling on the corners “you gonna get caught up” due to the heavy police presence in the area. “You can’t gangbang and make your money at the same time,” he said. Gangbanging and moving weight are incompatible. Only a step or two above the user, street level dealers in Little Village and elsewhere in Chicago are at the bottom of a vast distribution chain with many players. There’s no doubt that it’s essential to get beyond the sensational stereotypes and understand the real situation in the day-to-day lives of Little Village residents if we are to move forward with effective violence prevention and treatment. Despite the assumptions that the media has painted with a wide brush, we now know what Little Village isn’t. It is not a major drug trafficking destination; it is not an open market of hard drugs; it is not a haven of chemical dependency nor a narcotics’ battlefield. Little Village is a multi-generational immigrant enclave with a courageous work ethic and an even bolder sense of pride, but it continues to face a “Chicano killing Chicano” problem that is not sparked by the drug trade, but instead finds its roots in the community’s hybrid identity and sense of belonging and the systemic factors that impact the social fabric of La Villita.